Oh my gosh, this absolutely fabulous!!! I'm so impressed with your beautiful canvas!!! What a fabulous project. Love it! 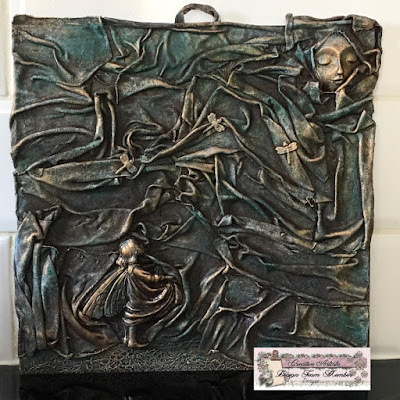 Such an original plaque combining texture and surprising girl characters. Stunning! This piece is mesmerizing! Stunning work and I love that the face is in the corner, really enchanting! Hugs, Autumn PS. Happy National Scrapbook Day! This is just wonderful Denyse! I love the texture--- AWESOME! Thank you very much for your nice visit on my blog and the kind comment! What a great idea creating a piece for the garden, love all the texture you've achieved on this.